From Britton & Brown (1898) An Illustrated Flora of the Northern States, Canada and the British Possessions. (Charles Scribner's Sons). Petunia A.L. Juss.,Ann. Mus. Natl. Hist. Paris 2: 215; (1803) (nom. cons. ); from petum, a South American aboriginal name for tobacco. Annual or short-lived perennial herbs, pubescent with glandular hairs, viscid. Leaves alternate or upper ones paired, simple, entire, petiolate or sessile. Flowers solitary in leaf axils, bisexual, usually slightly zygomorphic. Calyx campanulate, deeply 5–lobed. Corolla single (to double in cultivars), funnel-shaped or salver-shaped, white, pink or purple; limb shortly 5–lobed, the lobes induplicate in bud. Stamens 5, 4 in two pairs, the 5th the shortest, inserted on corolla-tube; anthers bilocular, not cohering, versatile, dehiscing by longitudinal slits. Ovary bilocular; stigma capitate. Fruit a smooth capsule, opening from apex, enclosed by calyx. Seeds globular to angular. A genus of 30–40 species mostly native to mountainous areas of South America, especially Brazil, with one species reaching North America. The genus is closely related to Nicotiana from which it differs mainly in having solitary flowers and a base chromosome number of n=14 (Nicotiana n= 12). Two species naturalised in Australia; a third species widely cultivated as an ornamental and occasionally occurring as a garden escape. D.E. Symon, The solanaceous genera, Browallia, Capsicum, Cestrum, Cyphomandra, Hyoscyamus, Lycopersicon, Nierembergia, Physalis, Petunia, Salpichroa and Withania, naturalised in Australia, J. Adelaide Bot. Gard. 3: 133–166 (1981). Specimens previously referred to as Petunia parviflora in the Flora of Australia treatment of 1981 are now usually to be found under the name Calibrachoa parviflora. Opinions vary as to whether Calibrachoa and Petunia should be treated as distinct genera, Hunziker in his Genera of Solanaceae (2001) still absorbing Calibrachoa within Petunia. However the majority of publications now accept the two genera and support continues to grow. Recent DNA studies (T. Ando, H. Kokubun, H. Watanabe, N. Tanaka, T. Yukawa, G. Hashimoto, E. Marchesi, E. Suárez & I. L. Basualdo (2005). Phylogenetic analysis of Petunia sensu Jussieu (Solanaceae) using Chloroplast DNA RFLP. Ann. Bot. 96: 289-297.) provide further evidence for the split. Calibrachoa species differ from Petunia by their woody stems and by their diploid chromosome number of 18 rather than 14. There are also differences in corolla aestivation (conduplicate in Calibrachoa, imbricate in Petunia) and in the walls of the cells of the seed coat (straight in Calibrachoa, wavy in Petunia). The type species of Petunia was previously considered to be P. parviflora, now transferred to Calibrachoa. 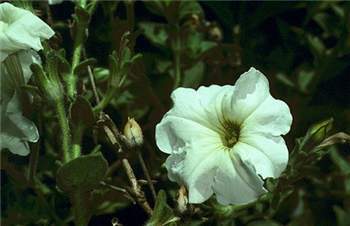 In order to retain the genus Petunia in the generally understood sense, it was necessary to change the type species of the genus. A new type was proposed by Wijnands et al. in 1986 in Taxon 35: 748-749 and this proposal was accepted. The conserved type of the genus is now P. nyctaginiflora A. L. Juss. The previously considered proximity of Nicotiana and Petunia is not supported by molecular studies, with Nicotiana now considered to be more closely related to the Anthocercideae group (Clarkson et al. 2004). Clarkson, J.J., Knapp, S., Garcia, V.F., Olmstead, R.G., Leitch, A.R. and Chase, M.W. (2004). Phylogenetic relationships in Nicotiana (Solanaceae) inferred from multiple plastid DNA regions. Molecular Phylogenetics and Evolution 33: 75–90. http://depts.washington.edu/phylo/OlmsteadPubs/Clarkson.2004.MPE.pdf.